Have you ever thought about setting up a bank or an insurance company? When I first worked in the insurance industry I used to fantasise about starting a new insurance office, but that was merely the day-dreams of youth, largely based around the idea of making my then very tedious job redundant. Yet in the earliest days of the Australian colonies that is what happened. Groups of men got together, pooled resources and kicked off these necessary commercial institutions. One such establishment was the Royal Bank of Queensland, set up under Royal Charter (how hard would it have been to obtain that from the farthest outpost of the Empire?) in Brisbane in 1886. The aim of these enterprises was to retain capital locally in the colony to provide further growth, rather than having profits repatriated to England. 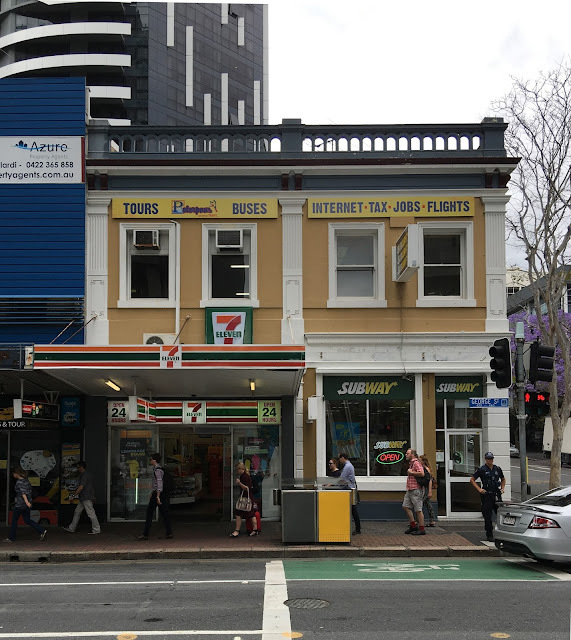 The Richard Gailey designed building that we are looking at today is in George St and was originally erected in 1885 as two shops, but leased to the Royal Bank of Queensland in 1888. Here is a current photograph of the building, the last structure in Brisbane with associations to the Royal Bank of Queensland, although some of their other buildings elsewhere in Queensland remain and are heritage listed. This building is listed on the BCC heritage register. In the days prior to Federation banks issued their own currency. In fact they did so right up to 1910 when the Australian government legislated to prevent private banks from issuing notes. Here is a copy of one of the bank's own £20 notes from 1886. In the years leading up to the 1890s Brisbane, and George St in particular, were in an expansionary phase, but the inevitable bust cycle arrived in tandem with the 1893 flood, a double-whammy that took Queensland many years to recover from. There had been heady days in commerce, but the boom and bust cycles that repeated themselves in those times made life very difficult for a fledgling bank. 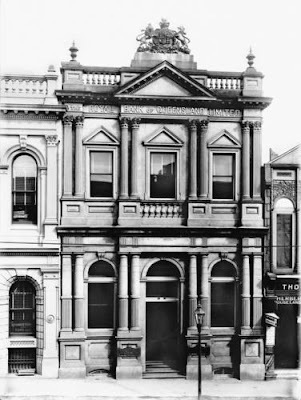 The Royal Bank of Queensland built this head office in Queen St in 1891. It was replaced in 1930 by a new National Bank building that still stands in the Queen St mall. Yet in 1893, only a couple of short years later, there was a petition to wind up the bank after it was forced to suspend business in a knock-on effect following financial problems at other banks. 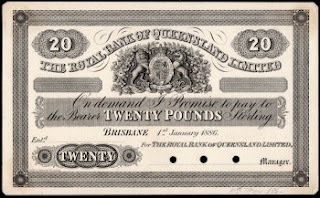 The Royal Bank of Queensland managed to survive that period and it existed for another two decades. The Royal Bank of Queensland merged with the Bank of North Queensland in 1917, forming the Bank of Queensland. A mere five years later the Bank of Queensland was folded into the National Bank of Australasia. The Bank of Queensland that exists today emerged in 1970 from beginnings as a building society and subsequent mergers with other institutions. It has no association with the Royal Bank of Queensland discussed here. The 1891 bank building is actually a different structure in Queen St that no longer exists. The Royal Bank of Queensland's head office wasn't big, but it had a bankish elegance. I was hoping that banks did not issue their own currency before Federation, if for no other reason than to prevent "fake" notes. The Reserve Bank reported that in 1853 Queen Victoria consented to the establishment of a branch of the Royal Mint in Sydney. Branches of the Royal Mint were later established in Melbourne (in 1872) and in Perth (in 1899). It must have been confusing with all of the banks printing their own money! Thank you Karina. Best wishes to you & yours for Christmas and the ensuing New Year. I have only just discovered this site. Good on you for sharing your knowledge about our history. I walk past many of these buildings every day and don't know anything about them. I will be a regular reader from now on. There are TROVE articles concerning the appointment of Mr Alexander Anderson of London who came out from England as head of the what is stated to have been The Bank of Queensland. As per newspaper article he arrived 4 April 1863. having Also that on 24th July 1866 the business of the bank ceased. Mr. A. Anderson, the manager of the Bank of Queensland, arrived in this colony from England by the January mail steamer, and he has lost no time in making his arrangements for commencing business with the least possible delay. There can be no doubt that the new institution will command a large share of public confidence and secure a corresponding amount of business. The paid-up capital of the bank is £250,000. In all probability, under the system of management stated, this sum will not be adequate to the large business of the bank; and Mr. Anderson will find it necessary to draw largely upon the subscribed capital, which is fixed at £1,000,000, to meet the requirements of our rapidly increasing population and trade. Is it possible to obtain any further information on the gentleman from London as we believe he was a part of our family history...? Sorry - nothing to hand on Mr Anderson. Good luck with your search.